Music for Chamber Orchestra owes much to Shostakovich and the English string tradition. Two Pictures is a winsome diptych, the Concerto for Trombone a jovial divertissement. Best of all is A Song for Chris, an ear tingling cello concerto of ingenuity, beauty and substance. Tovey, conducting the BBC Concert Orchestra, does Gregson proud. 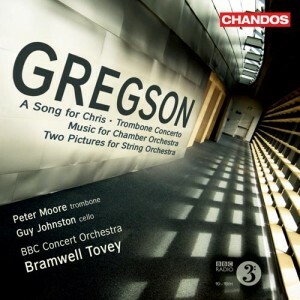 During the past several years, Chandos has issued a number of excellent CDs of the orchestral music of Edward Gregson, and this latest issue continues the very welcome exploration of this remarkable compress’s output….A Song for Chris is a memorial cello concerto..It is a beautifully balanced work, and is quietly impressive…The recording is of the quality we have come to expect as standard from Chandos; the result is a most welcome CD of no little distinction. A splendid showcase not only for the composer and the two excellent soloists but also for the BBC Concert Orchestra, excelling itself under the Canadian conductor Bramwell Tovey. Brilliant, cleanly focused Chandos sound.